Scott Kathmann has a doctorate in Physical Therapy. He is a native of Caledonia Michigan. Scott performed his undergraduate work at the University of Detroit Mercy, where he earned a bachelor’s degree in Sports Medicine/Athletic Training in 2002. From Detroit, Scott moved onto Belmont University in Nashville, TN where he earned his doctoral degree in Physical Therapy in August of 2005. Following graduation Scott moved to Bluffton SC and worked at a small outpatient physical therapy practice on Hilton Head Island where he specialized in orthopedics. Scott has attended numerous continuing education courses since graduation and he received his STC(Sports Therapy Certification) in June 2007. In August of 2008 Scott, his father in law Ken and his friend Wil broke away from their current positions and opened Elite Physical Therapy & Sports Performance. Outside of work, Scott and his wife Krista enjoy working out, spending time on the water and visiting with friends and family. Wil is a 1999 graduate of the University of South Carolina with a Bachelors Degree in Exercise Science. He then moved on to The Medical University of South Carolina in Charleston where he received his Masters Degree in rehabilitation with an emphasis in physical therapy. Since graduating in May of 2003, Wil has worked in the outpatient physical therapy setting treating a variety of orthopedic conditions with a focus on the shoulder and knee, and return to sport for the overhead athlete. In June of 2007, Wil completed his certification through the University of St. Augustine and the North American Sports Medicine Institute in sports physical therapy (STC). After working for several years in the Bluffton and Hilton head area, Wil joined with Scott Kathmann to form Elite Physical Therapy & Sports Performance in Okatie, SC. Wil resides in Bluffton with his wife Kelly, who is also a physical therapist, and their two daughters Madelyn and Ella. Melissa is a Florida native that attended the University of Arkansas where she graduated in 2007 with a Bachelors in Exercise Science/Biomechanics. During her time at the university she competed for the inaugural gymnastics team. While there, she was a four time Academic All American and was 2nd Team All SEC on the uneven bars. After Arkansas, she attended Washington University in St. Louis where she received her Doctorate in Physical Therapy in 2010. During her time in graduate school she gained experience working with general orthopedic injuries and surgeries, as well as pediatric conditions such as CP, spinabifida, and gross motor delay. Meghan attended North Georgia College and State University where she received her Bachelor of Science in Physical Education and Exercise Science in 2009. After undergraduate school, she attended physical therapy school at Emory University in Atlanta, GA where she received her Doctor of Physical Therapy degree in May of 2012. While at Emory, Meghan developed an interest in dizziness, vertigo and balance related disorders. Before graduating, she took additional course work and successfully completed an extensive vestibular rehabilitation competency-based course so that she could help treat patients with these disabling conditions. In addition to receiving additional course work in vestibular rehabilitation, Meghan gained knowledge and experience working with adolescent athletes, patients with orthopedic and neurological conditions and amputees. After graduating with her DPT, Meghan joined our staff in June of 2012. She is excited to be one of the only therapist in this area with knowledge and expertise in vestibular rehabilitation and is looking forward to growing with the Elite family. Joey Swearingen is a West Virginia native who received his bachelor’s degree in Athletic Training from West Virginia University (WVU) in 2006. After graduating from his undergraduate degree, he worked for one year as the Assistant Athletic Trainer at Fairmont State University before returning to WVU to receive his Doctorate in Physical Therapy in 2010. After graduation, Joey worked at a local outpatient clinic in Morgantown, WV where he specialized in orthopedic and sports rehabilitation. Joey and his wife moved to the Bluffton in the summer of 2015, where he continued to work in outpatient orthopedics at a small clinic on Hilton Head. Joey started working at Elite PT in the summer of 2017, and he received his Titleist Performance Institute (TPI) Level 1 Certification for screening of golf-related injuries. With Joey’s combination of experience, from athletic training to physical therapy, he works individually with each patient to focus on and achieve their specific goals. Beth is a Hampton County native and resides in Okatie with her husband, PJ and three children, Jake, Kyler and Catie Ross. She attended The University of South Carolina. She has over 10 years of experience in patient care and medical reception. 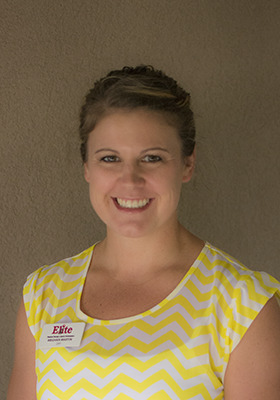 She is new to our administrative staff and looks forward to growing with Elite Physical Therapy.